Surprise! 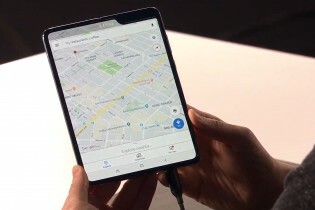 Despite all the S10 leaks, Samsung opened its Unpacked event with the Samsung Galaxy Fold. The device, which combines the portability of phones with the utility of tablets, is real and is coming to the market in two months. The Fold features a 4.6” external screen and a 7.3” foldable screen on the inside. There’s a unique hinge with interlocked gears that make opening and closing the device smooth (and improve durability too). The hinge can be a custom color, allowing for some personalization. App Continuity means that whatever you were looking at on the small screen instantly expands to the large screen when you open the Fold. Samsung worked with Google and Android devs to perfect this feature. 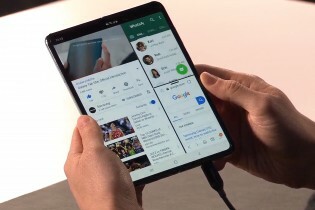 The large screen on the Galaxy Fold enables 3-way multitasking. WhatsApp, Microsoft Office and YouTube Premium will support this out of the box. To handle the extra load, Samsung picked a “7nm chipset” - the Snapdragon 855 – with 12GB of RAM and 512GB storage (fast UFS 3.0 storage to boot). All of this is powered by two batteries with a combined capacity of 4,380mAh. There are 6 cameras, but the folding form factor makes for an unusual arrangement. There are 3 cameras on the back, 1 on the front and 2 on the inside. Folded or unfolded, there’s always a camera available to photography what you want – you or your subject. We finish with a classic “good news, bad news” situation. This isn’t some prototype for a future product, it’s very real – and it can be your starting from April 26 in the US and May 3 in Europe. It will even be available in LTE and 5G versions. However its price will start at $1,980 in the US and €2,000 in Europe. That’s the cost of innovation, we guess. lol , I dont waste my money on thiefs who overprice their products.